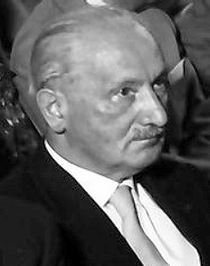 Martin Heidegger (26 September 1889 – 26 May 1976) was a German philosopher. His best known book, Being and Time, is considered one of the most important philosophical works of the 20th century. It is a very difficult book, even for the German reader. In it, and later works, Heidegger maintained that our way of questioning defines our nature. But philosophy, western civilization's chief way of questioning, has lost its way. Finding ourselves "always already" fallen in a world of presuppositions, we lose touch with what being was before its truth became "muddled". As a solution to this condition, Heidegger advocated a return to practical life in the world, allowing it to reveal, or "unconceal" itself. Martin Heidegger Facts for Kids. Kiddle Encyclopedia. This page was last modified on 13 April 2019, at 04:22.